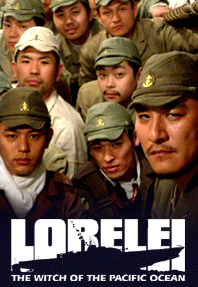 The makers of "Lorelei," beginning with Harutoshi Fukui, who wrote the best-selling novel on which the film is based, finesse inconvenient historical facts by an up-front resort to "what if" fantasy. The starring sub, the I-507, is a gift of the dying Nazi empire to the Japanese Navy in the closing days of the war. This sleek behemoth is equipped with imaging technology that is far in advance of the era's primitive sonar -- and is pure manga-esque invention. The mission, as revealed by grim-visaged Chief of Staff Asakura (Shinichi Tsutsumi) after the A-bomb attack on Hiroshima, is to intercept U.S. ships carrying more such weapons to Tinian Island, the base for B-29 bombing runs to Japan. This, of course, is complete fiction, as is the man charged with the mission, Commander Masami (Yakusho Koji) -- a brilliant destroyer of enemy ships relieved of his command when he opposed the navy's increasing reliance on suicide tactics. Given a last chance to redeem himself, he is burning with zeal, but is ignorant of the various secrets the I-507 carries on board. Once at sea, Lt. Takasu (Ken Ishiguro), the owlish technician in charge of the imaging system, refuses to tell Masami what it is or how it works. Masami also discovers that two crew members belong to the "kaiten" suicide corps. He has no idea why they are there -- and neither, for the moment, do they. Meanwhile, the U.S. Navy is tracking the I-507 with more than usual interest. What, Masami wonders, is going on here? Enough to say that a sweet-voiced teenage girl (Yu Kashi) is part of the master plan and that one of the minisub pilots (Satoshi Tsumabuki) becomes her protector -- and something more.